ConocoPhillips Alaska employees have a big, round target to hit that company leaders believe is the key to staying competitive. And it's not a buried treasure map that points right to where the next exploration well should be drilled — although with the company's recent success indicates they might have one of those, too. 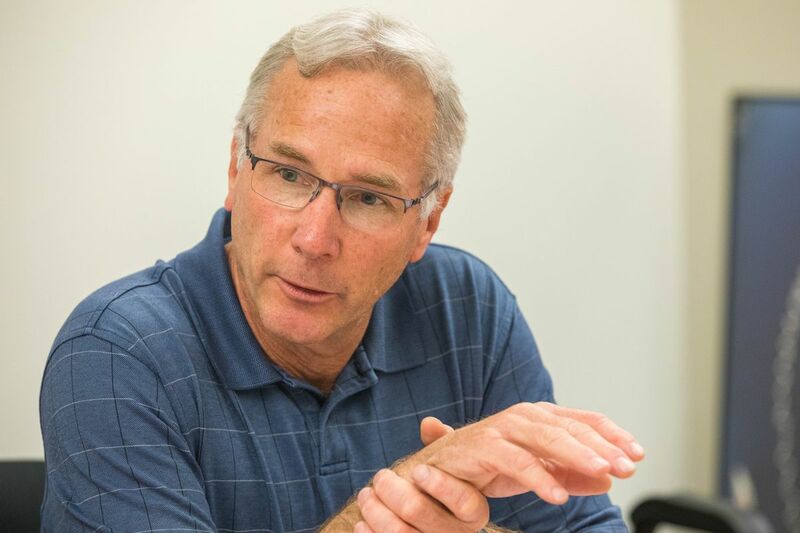 "It's just math," ConocoPhillips Alaska President Joe Marushack said during an Aug. 9 meeting with Alaska Journal of Commerce and ADN staff. The target is $40 per barrel, and making the math work so all of the company's operations in the state are profitable at or below that key price point. That $40 breakeven has been hit at ConocoPhillips' large existing Alpine and Kuparuk River oil fields, but also applies to all of the greenfield projects it's working on as well. Alaska Vice President Scott Jepsen said the $40 focus revolves around remaining competitive with Lower 48 unconventional oil plays for investment dollars within the company. Jepsen described the massive and ever-growing shale oil basins in Texas and North Dakota as "the center of gravity" for the oil business, noting those plays are "attracting tens of billions of dollars of investment this year." "Our chairman (Ryan Lance) said the higher the price of oil the greater the crash is going to be so we've got to be able to survive that volatility," Jepsen said. "2015 was a very, very scary time for us so we did an awful lot to reduce our cost — as did everyplace else we that we produce — and we were very successful at reducing our costs and we've got to be able to maintain that," Marushack said. Marushack added that some equipment redundancies have been engineered out of the company's equipment as well without sacrificing reliability. "At $110 oil you're focused on getting every barrel you possibly can," Marushack observed about the lack of cost emphasis when prices were high. Two projects now in permitting — Hilcorp's offshore Liberty and Oil Search's Pikka — should be big drivers, too, along with other, smaller projects. They see it as a "renaissance" on the North Slope, Marushack said. "We think it's really incredible what's happening," Jepsen added. "It's not just us. If you look at what's happening, there's a lot of stuff that — it's not just a concept or it's not just an exploration prospect — people are actually doing stuff; they're in the permitting stages and this stuff is going to happen." For ConocoPhillips, bringing much of that newly-found oil online will mean developing projects near the Native Village of Nuiqsut, which is located just east of the company's work in the National Petroleum Reserve-Alaska and very close to its Putu and Stony Hill Nanushuk discoveries made this past winter. Early estimates on each of those have been pegged at about 20,000 barrels per day. Marushack said the company listened to the concerns of Nuiqsut residents and did its best to address them. Residents' concerns led ConocoPhillips to postpone exploration drilling the previous winter. "We believe we're going to have to continue to engage with the village, not only with Kuukpik, but with the village and listen to what they say and then try to figure out where there's some things that they could participate in," he said. Jepsen said the company isn't exactly sure what direct impacts the proposed fish habitat permitting law changes would have on its operations, but the primary concern is with a new, public permitting process that could open avenues for lawsuits that don't exist now. "If the initiative goes forward I could see a very lucrative path for those organizations that are opposed to oil and gas exploration on the North Slope to pursue something that can slow us down," Jepsen said. The initiative's advocates, led by the nonprofit Stand for Salmon, stress that their primary goal is not to stop projects, but rather to codify in law best practices — and prevent them from being eroded by political forces — that are employed by Fish and Game in its habitat permit adjudications today. Jepsen added that while much of the company's work has little if any impact on anadromous fish habitat, its most common work that could be slowed is the annual building of ice roads that use water from area lakes.